To say that ADOT crews were busy Tuesday would be a bit of an understatement. North- and southbound lanes were closed at about 11:30 a.m. as 50+ crew members from three agencies — ADOT, DPS and Arizona Department of Environmental Quality — and the private cleanup company hired by the responsible party (the company that owns the tanker and employs the driver) worked to clear the road and prevent the hazardous materials from spreading into nearby Slate Creek. Southbound lanes were reopened within a few hours, but cleanup of the northbound lanes between the Saguaro Lake exit and SR 188 continued through the night. All lanes were reopened at about 3 a.m.
On a few positive notes, though … the driver sustained only minor injuries, there were no other vehicles involved in the crash and crews were able to stop the liquid before it reached the creek. 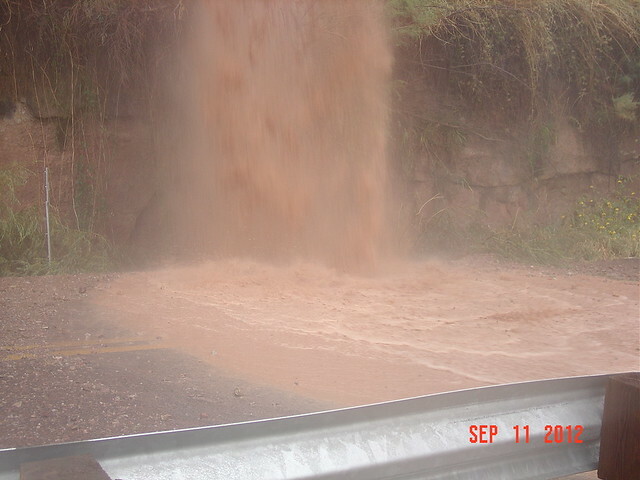 Heavy rains further north caused water to flow over a bluff above SR 264 just east of Tuba City in Navajo County washing out the roadway. ADOT crews reopened the roadway last night and are still working to complete additional permanent repairs. As you can see in the slideshow below, the damage was pretty extensive.